This weekend I bought a replacement pair of Black Diamond Midweight Gloves, the best pair of liner gloves I’ve ever owned. Made from Polartec Power Stretch, they have proved to be the most durable pair of liner gloves I’ve yet encountered. My current pair has survived two winters of regular use, including multiple winter camping trips, daily around-town wear, dozens of bike rides, hundreds of miles of skiing, and more. No other liner glove I’ve owned has lasted a single season; my dresser is filled with a motley collection of holey, ripped-up liner gloves (especially around the finger tips) that failed to survive a single serious winter outing. 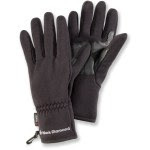 Black Diamond’s gloves are warmer than many thin liner gloves, with a fuzzy fleece-lined interior and smooth outer surface. The four-way stretch of the fabric ensures a snug, warm fit that also helps to provide almost complete dexterity. Their compact size makes them unobtrusive in your jacket pocket, so they’re easy to keep with you at all times. I use mine for bike rides in temps down to the low 30s, cross-country skiing in almost any conditions, and for walking the dog in the winter woods. Worn under a pair of warm mittens or gloves, they add substantial warmth and are an excellent hand base layer for outdoor adventures in the deep winter cold. Part of the appeal is that these gloves—like most Black Diamond styles—fit my hands particularly well. (Learn everything you need to know about glove fit in my AMC Outdoors article, Hot Hands.) Other manufacturers offer Power Stretch liner gloves, including Mountain Hardwear, Arcteryx, Outdoor Research, and more, but none fit me quite as well. Drawbacks? The gloves feature a leather piece across the palm to provide grip, but nothing on the finger tips for tasks that require utmost dexterity. (I can’t get enough grip on the smooth surface of credit cards in my wallet to pull them out.) The leather palm is a trade-off. It definitely provides better grip, but it also absorbs moisture and will freeze solid in cold conditions (usually when I’m not wearing them), compromising warmth significantly. I’ve also read numerous customer complaints about the stitching and seams prematurely wearing out, which is a problem I’ve haven’t personally experienced. Closely evaluate the seams before you buy for any obvious problems, I guess. Consider a pair for yourself or as an inexpensive ($25) stocking stuffer this holiday season.